The Gun Crazy collections have so far proven popular. I offer Gun Crazy Collection #3 as the most recent. Vendetta #9 - Nash turns himself into an insurance investigator tasked with discovering whether the death for a former drug dealer is cause for concern regarding a life insurance payout. The policy can’t be paid until Nash has finished his investigation into the old man’s former life. Along the way, Jim somehow manages to fall in love with the pretty and personable beneficiary. Secrets and lies conspire to keep Jim from learning the true story until the very end. A Girl's Best Friend #10 - Jim has a brand new Private Investigator’s license, but he can’t use it in Nassau. After a briefing in the Big Apple on the diamond market, he heads off to the sunny paradise to try and dissuade a friend from flashing a blue diamond at one of his infamous parties. Minus a guest list for the forty partiers, they’re all suspects in the murder investigation until Jim finally realizes that a woman he knows could be the prime suspect. Dead End #11 - A missing teenager draws Jim back to the scene of the crime in Mexico where Kara, his pregnant wife, was killed in an explosion aboard their sloop. He’s needed the intervening two years to get over the life-changing event, but now he’s ready to take another look in an effort to put it all behind him for good. He crosses the border, lands an exceptional deal on a rental car, and, realizing one of his shortcomings, hires a translator. Now all he has to do is find two missing girls and try not to fall in love all over again while doing it. No Harbor #12 - Jim Nash is well on his way to a complete recovery from events in his past life. He's in his second marriage and very happy. His job at the resort is secure. Then a blast from his past re-emerges and threatens to throw a wrench into his plans for the future. Will his bond with the new woman in his life be endangered? Tempted by old and familiar love into leaving the only safe harbor he has known, Jim is forced to making choices that could forever affect the new life he has chosen for himself. Dog Days #13 - Jim Nash is as content as he’s ever been—that is, until he manages to get himself arrested thanks to the new girl that has come into his life. While being held on trumped-up charges of murder, all the women in his life come together to post bond. With the local PD’s enthusiasm to pin the crime on him, he is forced into honoring payback in a form he will find very familiar. Startup Blues #14 - Being elected to the position of chief of police isn't everything it's cracked up to be when Jim has competent help to assist him. Bored with desk duty, Jim takes a short leave to use his P.I. license to help two sisters in their time of need. Persons unknown are harassing and threatening their startup business. To find out who, his quest leads him to gator country in the Florida Everglades, where he must separate business from the more than pleasurable sisters he is intent on protecting. 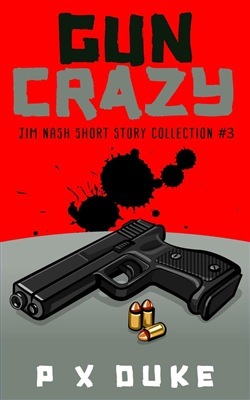 Acquista Gun Crazy 3 in Epub: dopo aver letto l’ebook Gun Crazy 3 di P X Duke ti invitiamo a lasciarci una Recensione qui sotto: sarà utile agli utenti che non abbiano ancora letto questo libro e che vogliano avere delle opinioni altrui. L’opinione su di un libro è molto soggettiva e per questo leggere eventuali recensioni negative non ci dovrà frenare dall’acquisto, anzi dovrà spingerci ad acquistare il libro in fretta per poter dire la nostra ed eventualmente smentire quanto commentato da altri, contribuendo ad arricchire più possibile i commenti e dare sempre più spunti di confronto al pubblico online.